However, all regions use nuoc mam (fish sauce). Salty and slightly pungent, this anchovy-based seasoning wonderfully complements various dishes as well as brings out the full flavor of broths and soups. 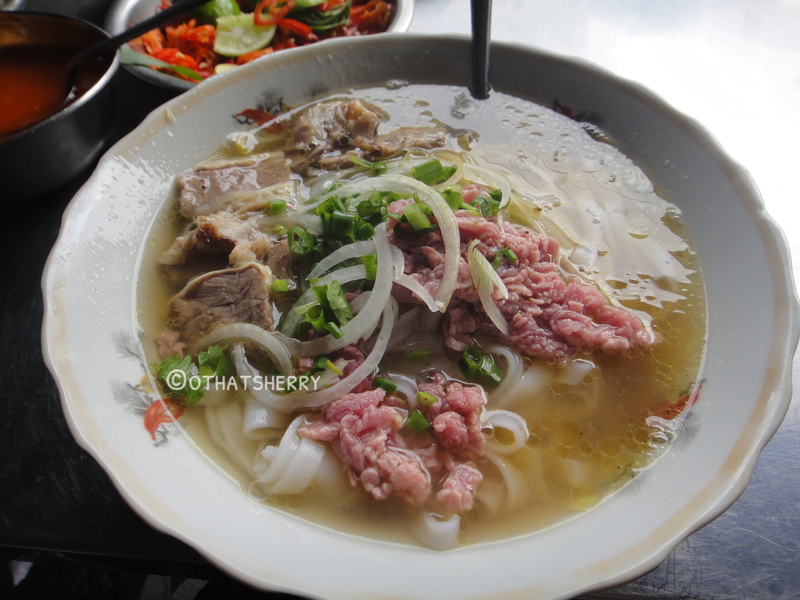 Vietnamese cuisine sets itself apart because of its freshness. 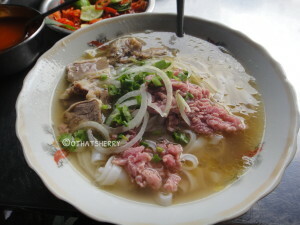 Hence, the best Vietnamese foods, are street foods. Stalls usually serve a single dish, cooked and served and eaten on the spot. 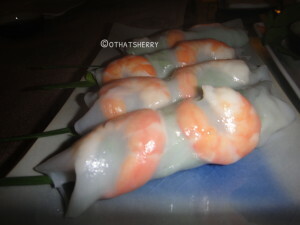 What makes the food so appealing is that it is super fresh. Nothing beats having your food prepared, from start to finish, in front of your eyes. The freshness of the ingredients ensures exquisite, complex texture and flavor combinations. To find the best vendors, simply look for the stall that is always crowded. 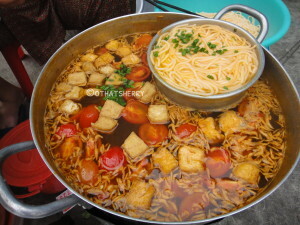 Tomato-based crab noodle soup, a popular northern Vietnamese noodle dish. 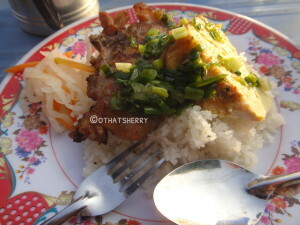 The “broken rice” dish, with grilled pork, pickled vegetables and egg, makes a satisfying meal. 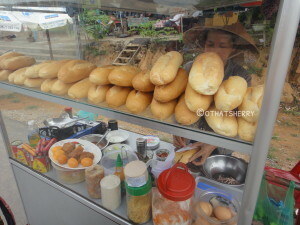 The Vietnamese baguette sandwich traces its origin to French colonial days. There are several variation for filling, such as headcheese, Vietnamese bologna, or grilled meats, are possible. Stuffed with seasoned ground pork, mushrooms and topped with fried shallots, these rice wrappers are baby-skin soft. 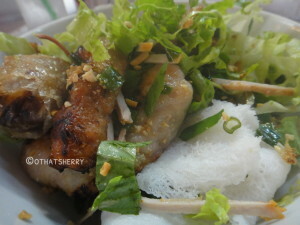 Fried spring rolls and grilled pork lay on a bed of fresh lettuce and vermicelli noodles, the dish is wonderfully cool n a hot day. 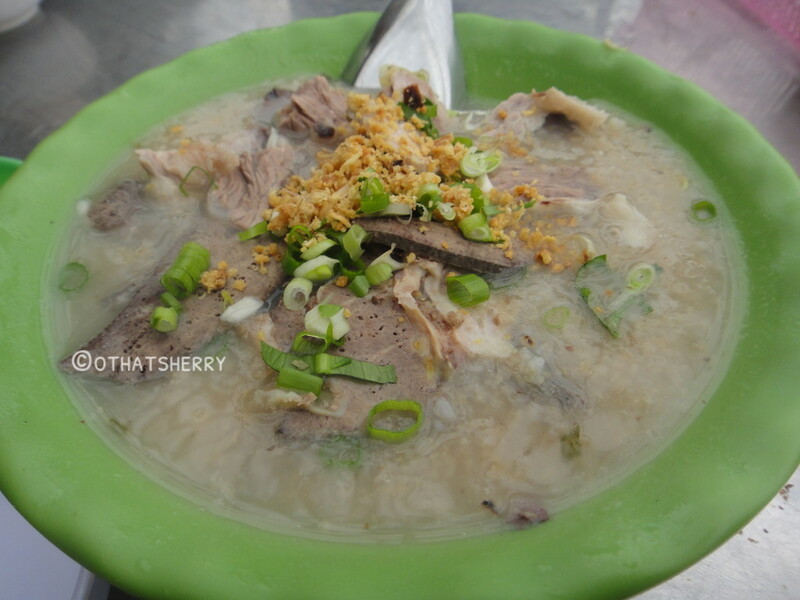 Zhou’ in Mandarin and ‘jook’ in Cantonese, the Vietnamese version is enlivened by lime and chopped chili. Vietnamese flan, also a remnant from French colonialism. 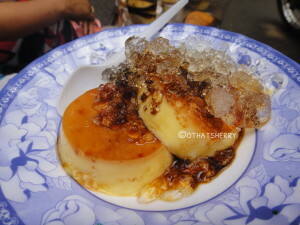 It is creamy smooth and has a bitter-sweet, slightly burned caramel taste to it. 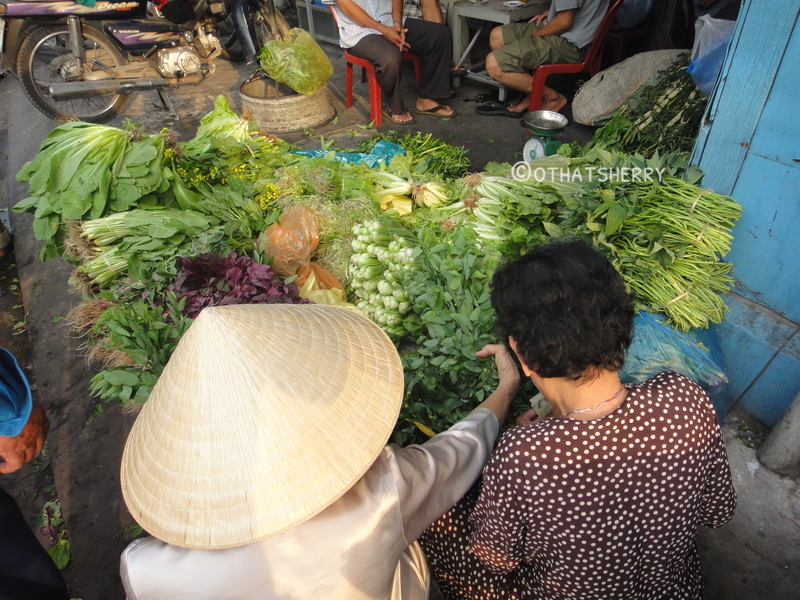 Ben Thanh Market (District 1) is a great place to start your eat-fest, but it is touristy. Instead, take a motorbike taxi to District 4 and visit a traditional early morning fresh market, where cornucopias of colorful fruits and vegetables, still-wriggly fish, dried foods, and food stalls line the street. 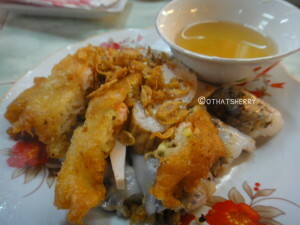 The best place to sample an array of appetizer rolls, beautiful both in presentation and taste, is Dong Pho (57 Ho Xuan Huong | District 3). You’ve somehow managed to capture Vietnamese cuisine into writing where every word drips of the flavours you’ve described.